We assure you about the quality and purity of the Topaz Stone which is not possible for others. We believe in customer satisfaction as we sell these stones to them and earn their faith. People love to buy Topaz Stone from us because they have faith in us. 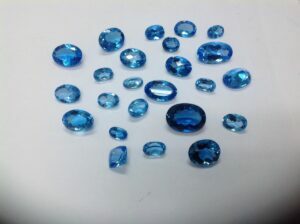 We are experts in Topaz Stones and we make them available in all Topaz colors and shapes. A Topaz gemstone is at number 8 on the Moh’s Scale of hardness and its absolute hardness is 200. 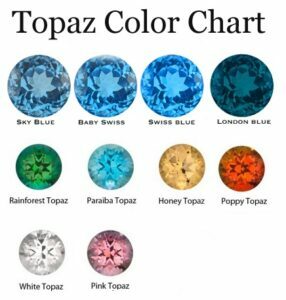 The Topaz stone comes in a variety of colors like deep golden yellow (Imperial Topaz), blue, light to medium brown (Champagne Topaz), pink and white or clear topaz. The most popular and desired color of Topaz stone is the brown and yellow color. Navneet Gems and Minerals is the connoisseur of this stone and are the most demanded stones. The largest producer of the Topaz Stone is Brazil but it can also be found in USA, Sri Lanka, Myanmar, former USSR, Australia, Tasmania, Pakistan, Mexico, Japan and Africa. Though, USA is the leader in Topaz mining. The different shapes of Topaz Stone available at our place are heart, round, oval, rectangular, trillion, etc. London Blue Topaz, Swiss Blue Topaz and Sky Blue Topaz are our main attractions. We supply all precious and semi precious gems worldwide, especially for Topaz. We cut almost all of our White Topaz stones in our factory in India and Thailand and send it overseas to our plant for color treatment (swiss blue takes almost 2 years and sky takes 3 to 4 months). Our shipment goes for treatment every month because we have regular customers who are buying in quantities of thousands in every shape and size. Here we explained the procedure through a chart. To buy Topaz Stone, you can contact us at info@navneetgems.com or click the Contact Us link above, and if you want us to disclose the wholesale prices, then you can send your query to us as well.